When I started ‘collecting’ wrist watches, I never considered Oris as a serious option. They made nice mechanical watches, had nice designs, but brands that ‘do’ doubl?É¬© or plaque gold cases were off-limit. I also wasn’t very convinced about the quality of the watches. Perhaps I didn’t do Oris any justice, because afterall, this brand exists since 1904 and have this ‘only mechanical movements’ philosophy. Anyway, I skipped Oris and rather went with brands like Omega (when they were still very affordable). Since a few years, you can’t deny the fact that Oris upscaled in terms of quality and image. Their collection became a bit more ‘of this time’ and became a serious ‘entry-level’ watch, where – perhaps a bold statement – Omega stood before with their 1500 Euro Seamaster or Speedmaster Automatics (Reduced), there is now Oris. Omega up scaled, ruling out some of their previous client?É¬®le, and now they can go Oris if they want. At least, that’s how I see it in a nutshell. 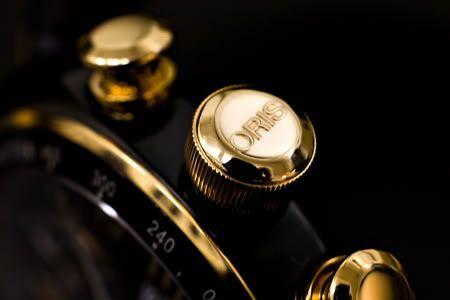 Oris gained a lot of respect amongst watch collectors and aficionados that are looking for a decent sports watch, for a fair price. 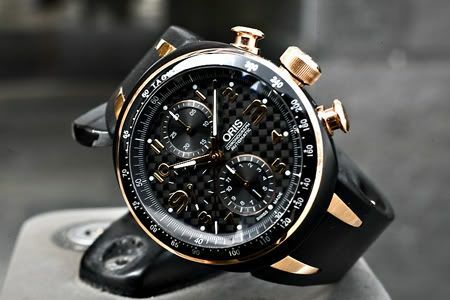 Popular Oris watches are their divers watches and chronograph watches. 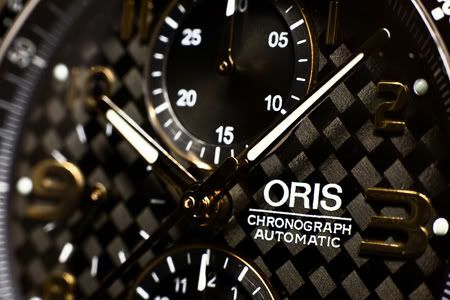 Oris connected their name to the F1 Williams team since a few years and this partnership really bumped their chronograph collection to a new level. The Oris TT3 Chronograph is the watch I selected over at Ace Jewelers to have a closer look at. This Oris TT3 Chronograph is massive! The watch measures 42.5mm in diameter, which is as big as the IWC Ingenieur 3227-01 or the IWC Portuguese Automatic. The case is made out of titanium and is black plated, which gives it this ‘stealth but still aggressive’-look. The pushers and crown are stainless steel and rose gold plated. I wonder why they still use the plated gold stuff, it looks good, but I wonder if it keeps looking that way. Time will tell and I assume that Oris has thought this over. The dial of the watch is simply stunning, this is very hard to capture in a picture (as always). Through its sapphire AR coated crystal, you’ll see the black carbon fibre dial with its rose gold Arabic numerals and Super Luminova dots and filled hands for luming up in the dark. The date window on a chronograph to me is almost a no go, but Oris managed it to have it placed in such away, that it isn’t disturbing when reading the time or chronograph hands. It doesn’t bother at all. Having Oris compared to the former Omega Speedmaster Automatic Reduced, I need to give you some more arguments I guess 🙂 Oris uses a Oris caliber 674 movement, which is based on the famous ETA (Valjoux) 7750 movement. This movement, in contrast to the movement used by the Speedmaster Reduced, is a true chronograph movement. The movement used by the Speedmaster Reduced was a piggy backing movement. This means that it was a regular (ETA) movement, that could display hours, minutes and seconds, but was completed with a Dubois-Depraz module on top for the chronograph functionality. You can easily identify the use of such modular constructions by the position of the pushers and the winding crown. When all operating devices are aligned perfectly, it is a true chronograph movement. When they are not, as with the Speedy Reduced, it is a piggy backing movement. The pushers are aligned a bit higher than the crown, when seen from the side (laying on the caseback). I don’t have to tell you that I am in favour of true chronograph movements, even if it was only for the location of the pushers and crown. Not only Omega, but a lot of brands used (and some of them still use) the piggy backing construction. However, Oris don’t. 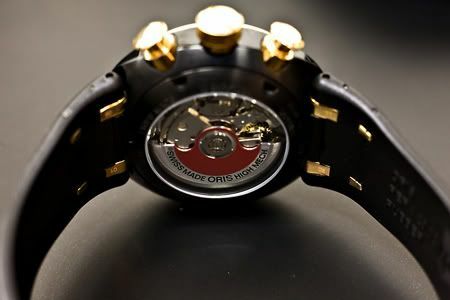 The rotor of Oris’s mechanical watches are red, this is even a registered trademark by Oris. Although I don’t fancy a display back myself anymore (I got a bit tired of them), I can imagine that a lot of people do like them. The Oris TT3 Chronograph comes on a rubber strap and a folding buckle. The stainless steel rose gold PVD plated folding clasp works perfectly, no parts sticking into the backside of your wrist (as some do) and the rubber strap makes it a very comfortable watch to wear. Despite the size! Thanks to AceJewelers for providing the Oris watch and Dimer for making the photos of the TT3.